In this article, we will show you how to use Alibaba Cloud Global Acceleration to speed up access to overseas servers from China. In some cases, a customer may have some limitations to migrate all of their resources to a specific cloud provider. 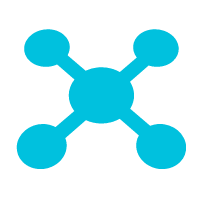 For example, if the customer has deployed a hybrid cloud environment, the customer may host certain core services on his or her on-premises data center. It could also be the case that customers may have subscribed services from multiple service providers, such as having a multi cloud environment hosted in Alibaba Cloud, AWS, and Azure. If the connection is across different regions, network latency and interruptions may occur. In this case, Alibaba Cloud provides the Global Acceleration (GA) service and reverse proxy to help customers improve the stability and reliability of traffic flow between China and overseas. 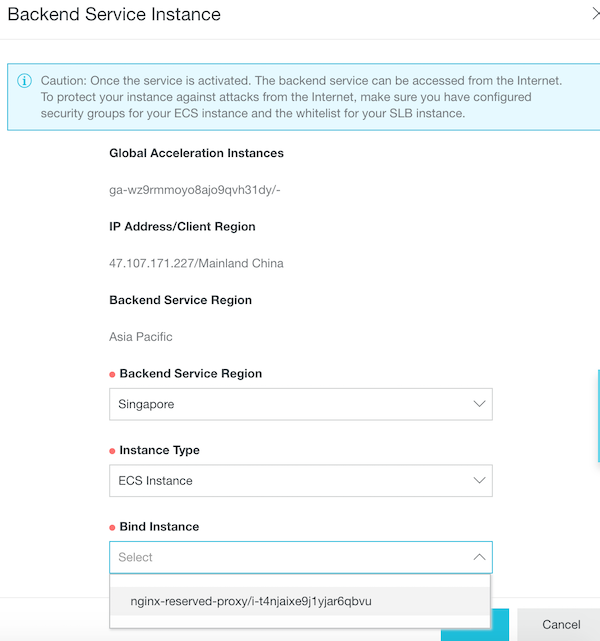 Elastic Binding: You can bind a backend service to a Global Acceleration instance to accelerate the Internet access, and unbind that backend service whenever the Internet acceleration is no longer required. 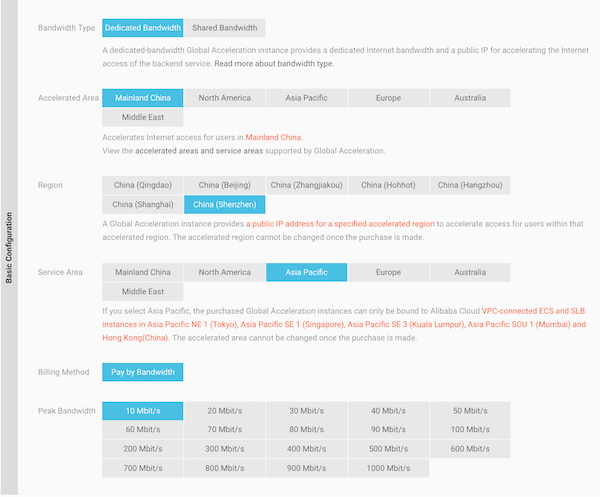 Configurable Network Capabilities: You can adjust the bandwidth of a Global Acceleration instances based on your business needs. Changes take effect in real time. In this article, we will show you how to use Alibaba Cloud Global Acceleration to speed up access to overseas servers from China. We will be connecting a service hosted on an AWS server in Singapore to an Alibaba Cloud server in Shenzhen. Let's assume that we have an Elastic Compute Service (ECS) instance ready at Singapore region with Nginx installed. If you are not sure how to do so, read the official guide here https://www.alibabacloud.com/help/doc-detail/50700.htm. Go to the Global Acceleration console under VPC section. Create an ECS instance in Shenzhen region with the following configurations. When deploying services within Mainland China, you will need to complete real name registration if you haven't done so already. The result shows that the connection with Alibaba Cloud GA is 0.189ms while the direct connection to the AWS endpoint is 0.442ms. That means we have sped up the connection more than 2 times compared with direct access to the AWS endpoint. 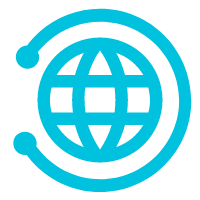 Global Acceleration (GA) is a network acceleration product enabling nearest possible access to network services around the globe.